There would be no chance of a US-UK trade deal if there was any weakening of the Good Friday Agreement, a senior American politician has said. 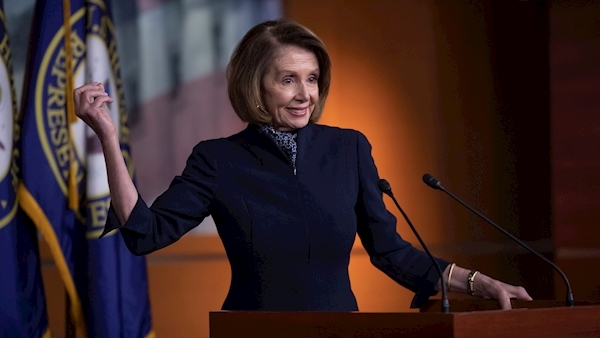 US House of Representatives speaker Nancy Pelosi told a packed lecture theatre that the Good Friday Agreement was a model that could not be “bargained away in another agreement”. Speaking at the London School of Economics on Monday Ms Pelosi said passing a trade bill in Congress would be very hard and was “no given”. She added: “First of all it is very hard to pass a trade bill in the Congress of the United States, so it’s no given anyway. But if there were any weakening of the Good Friday accords there would be no chance whatsoever, a non-starter for a US-UK trade agreement. The Good Friday accords ended 700 years of conflict. “This is not a treaty only, it’s an ideal, it’s a value, it’s something that’s a model to the world, something that we all take pride in. Ms Pelosi is to meet Taoiseach Leo Varadkar and Tanaiste Simon Coveney today as part of a two-day fact-finding visit by a congressional delegation from the US House of Representatives, which includes several members of the ‘Friends of Ireland’ caucus. Mr Varadkar says the visit is a good opportunity and is evidence of the deep and historic ties between Ireland and the US. The delegation will meet with the Taoiseach at Government Buildings this afternoon, following a lunch hosted by the Tánaiste and culminating with a dinner hosted by Mr Varadkar tomorrow night at Dublin Castle.